As the old adage goes, “If it don’t make dollars, then it don’t make sense.” According to UFC light heavyweight king Jon Jones (Pictured), a rematch with Lyoto Machida don’t make sense because it won’t make him any cents. 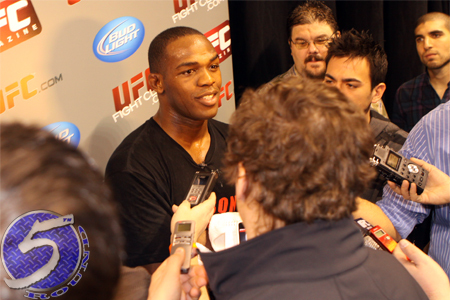 “I don’t want to fight Lyoto Machida,” Jones flatly told ESPN.com. “He was my lowest pay-per-view draw of last year. No one wants to see me fight Lyoto Machida. I don’t want to fight Lyoto again. Jones’ 2011 campaign was arguably the most masterful the sport has ever witnessed. After handing Ryan Bader his first professional blemish in February, “Bones” went on to become the youngest champ in UFC history by taking Mauricio “Shogun” Rua’s title just one month later. The now-25-year-old then throttled former champions Quinton “Rampage” Jackson, Machida and Rashad Evans. Nonetheless, UFC president Dana White anointed “The Dragon” the division’s top contender after putting Bader to bed earlier this month. Unfortunately for Jones, he claims that lodges him in a tough and unprofitable predicament. Jones defends his throne against Dan Henderson at UFC 151. While he’s not looking past his September 1st date, where he’s currently pegged as a whopping 7-to-1 odds-on favorite to dispose of the veteran, he doesn’t seem too impressed with what the weight class has in store for him down the line.